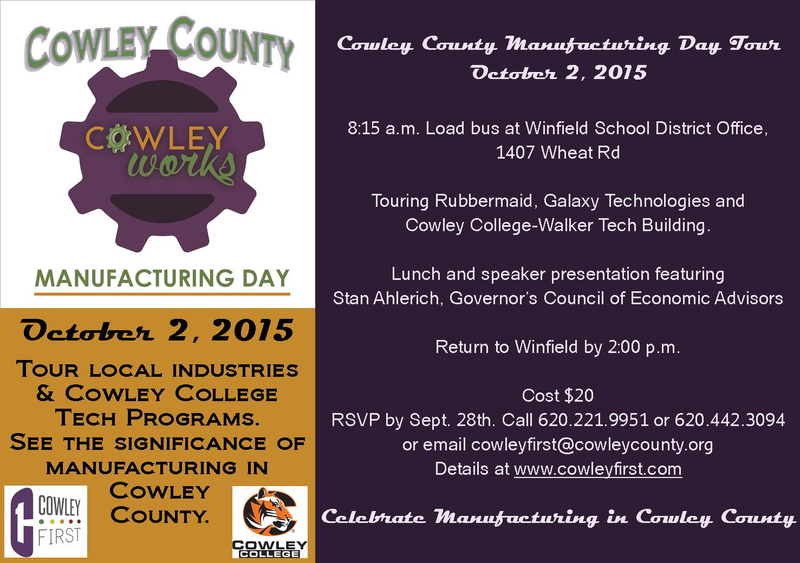 Cowley College, in partnership with Cowley First, Galaxy Technologies, and Newell Rubbermaid is celebrating National Manufacturing Day on October 2nd by offering a manufacturing tour. National Manufacturing Day is designed to expand the knowledge about and improve the general public’s perception of manufacturing careers and the industry’s value to the U.S. economy. Cowley County is ranked No. 11 for manufacturing employment in the State of Kansas, boasting an average employment of 3,628 people in manufacturing related jobs. In celebration of Manufacturing Day 2015, Galaxy Technologies and Newell Rubbermaid will provide a behind the scene glimpse of manufacturing and training opportunities in Cowley County. Following the industry tour, Cowley College will welcome attendees to the Walker Tech Building at the Arkansas City campus to see first-hand the tech programs that align with local manufacturing. Click here to view full-size tour flyer. Lunch and a speaker presentation will complete the event. Stan Ahlerich, Executive Director of the Governor’s Council of Economic Advisors, has been invited to speak about the impact of manufacturing on the local and state economy. Ahlerich has been a member of the local Winfield Economic Development Board for 15 year, served as President of Kansas, Inc. a public/private economic policy research agency from 2004 until 2010, and owns, manages and operates an agricultural enterprise in Cowley County. Ahlerich has worked in the area of economic development at the local and state level and has multi-level experience with financial institutions. Click here to view full-size lucheon invitation. Individuals interested in attending must register in advance by calling Cowley First at (620) 221-9951 or (620) 442-3094 or email cowleyfirst@cowleycounty.org. Cost is $20 and includes lunch and transportation. Attendees will be picked up by bus at Winfield School District Office, 1407 Wheat Rd, Winfield at 8:15 and return by 2 p.m. Deadline to register is September 28th, but tour capacity is limited to 50 so do not delay. Cowley First has also organized additional Manufacturing Day tours throughout October geared towards local high school students interested in technical and trade careers. Cowley College, Fluid Kinetics, Galaxy Technologies and Newell Rubbermaid are once again involved in the annual experience and coordinated efforts with local high schools.